So NOT your basic London Dry. Dieter Meier is… well let’s just say he is a man of many talents. He was born into wealth, but struck out on his own, becoming an industrialist in his own right, a professional poker player, member of the Swiss national golf team, and founding member of the electronic music group “Yello” (remember the song “Oh Yeah!” from the movie “Ferris Bueller’s Day Off?”). Anyway… a few years ago he diversified into Argentinean Wines. And from there he has stepped into South America-influenced Gin. Ojo de Agua translates from the Spanish as “Eye of the Water,” or “watering hole.” Ojo de Agua Dry Gin starts with a combination of distillates, including some of Dieter’s Argentinean Malbec Wine, a lemon liqueur, and blackberry from his South American farm. Then it’s infused with juniper, lemon zest, coriander, orange zest, angelica, rosemary, lavender, and yerba mate, which is the tea-like national beverage of Argentina. All of that is sent back to Switzerland where it is triple distilled into Ojo de Aqua Gin. "Oh Yeah!" 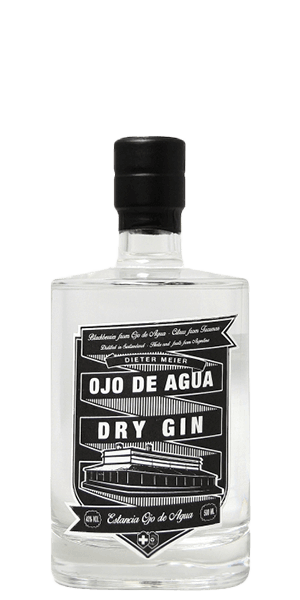 What does Ojo De Agua Dry Gin taste like? The Flavor Spiral™ shows the most common flavors that you'll taste in Ojo De Agua Dry Gin and gives you a chance to have a taste of it before actually tasting it. Zesty, rosemary, lavender, lemon zest, blackberry, coriander, pine, floral, herbs.